The entire ensemble from Minford High School, for The Sound of Music being presented this weekend. Front left is Minford Music Director, Lacey Ratcliff. Some of the seniors who are essential parts for The Sound of Music. 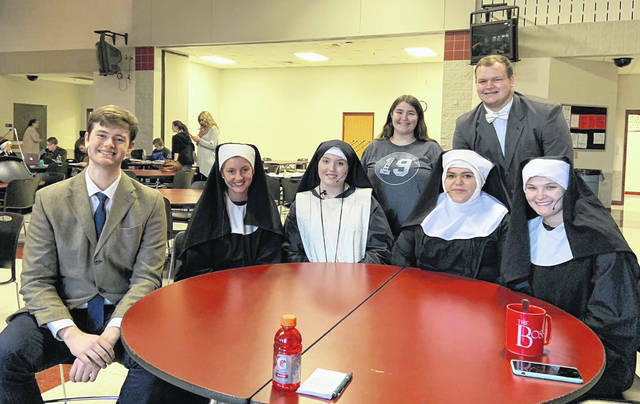 Front Row, Left to right: Abe Heimbach, Jodi Hannah, Aeriel Parker, Deanna Hoover, McKenzie Kennedy; Back row l to r: Shelby Blackburn and Jake Alley. 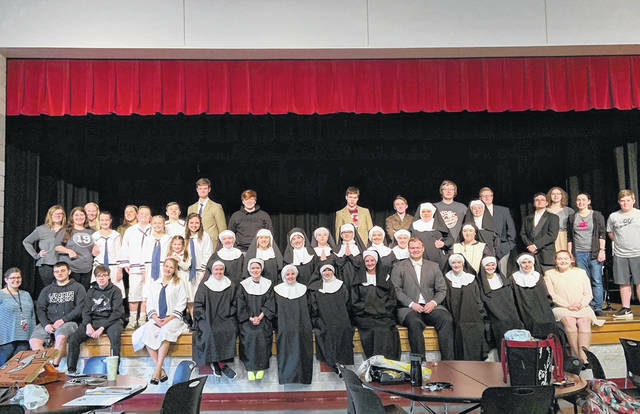 Entering Minford on Friday or Saturday night, you might hear the sound of music coming from the high school, seriously, “The Sound of Music” is being presented by the high school this weekend. Seven Seniors who play major roles in the musical and have played major roles before were all together for their last musical. They said they are so close and this musical is bittersweet for them as they will soon be graduating and not spending time together as they have been for so long. All the girls have been together doing Musicals for all four years. They are: Abe Heimbach, who is playing Captain von Trapp, Jodi Hannah, playing Maria von Trapp, Aeriel Parker playing Mother Abbess, Deanna Hoover playing Sister Berthe, McKenzie Kennedy, playing Sister Sophia, Jake Alley as Max Detwiler, and Shelby Blackburn who has the important role of stage manager and has been the stage manager for the past four years. Hannah says this is the second year she has played a lead role in a Musical. “I’m definitely nervous for this weekend, but at the end of it all, it’s so fun, it’s rewarding, definitely worth all the time put into it.” As for this being her last show, she says, “It’s heartbreaking, I know I’ll come back and watch shows, but it just won’t be the same. It is bittersweet.” Hannah’s plan after graduation is to attend Shawnee State University and then transfer later on because to be a speech pathologist, possibly Ohio University or Marshall. Ratcliff says that in the four years of a senior’s time, she tries to vary the type of shows they do. She said she feels like it’s really important. “I’m really excited about this show being their senior year,” she said. “The Sound of Music is just something I love and I think this is a great show.” Ratliff has several younger children that the musical calls for and one of them is just in kindergarten, but the older students just takes them under their wings.